They are calling for Sun and temperatures in the 70’s this weekend. 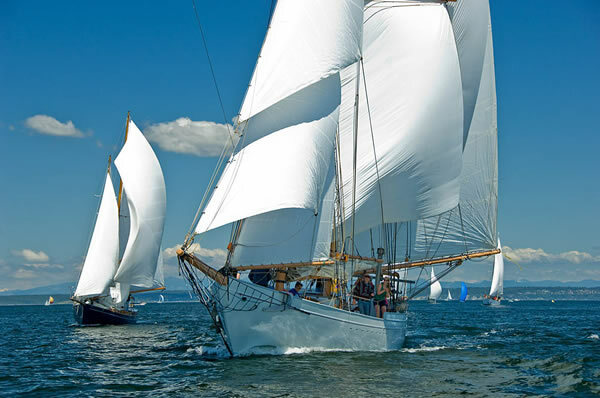 We hope you are planning to come for the Classic Mariners Regatta. If you don’t have a wood boat of your own, there are plenty of people looking for crew (and we are talking about some fast boats here!) Come to the skippers meeting to connect with the skippers in need: Saturday morning at 9:30 am at the NW Maritime Center above the boat shop. You can still register at the Welcome Party Friday night 6:30-10. Free beer and snacks and lots of sailors to talk to. Don’t miss out! The refurbished trophies are awaiting your name engraved. The pennants are completed. All we need is YOU.